Even with the rise in virtual meetings, there is nothing quite like being face-to-face with people. At some point just about every small business owner will find himself or herself on the road to a conference, speaking gig, or client engagement. To me this time is precious time spent away from home and things I love, so I do my best to make the most of it. Yet there are still hours on end spent en route that can be used to your advantage. I used to just grin and bear these times impatiently waiting to “get there already”. Then I finally stopped fighting the inevitable and decided to treat the time en route as “found time” and bang out work, take care of myself, and do whatever I could to capitalize on my captivity (let’s face it flying coach class is unpleasant captivity). I literally freed up hours when I arrived/returned so I could have more fun. Here are my favorite ways to make the most of all that dead time spent waiting, flying, or on a train. Whether you choose to get work done, learn something new, or rest well so you can be at your best when you reach your destination (or mix it up like I do), I guarantee you’ll make more effective use of your time. Whether you are feeling mentally sharp and ready to be creative or weary from early morning wake-up calls and airport shuttles, there is something on this list for you. Never underestimate the power of capitalizing on this time so you can free yourself up for more fun and profit when you’re off the road. Don’t miss a single business tip, article, or video ever again. Get email updates of the blog. Want to grow your business consistently and still have time for an active life? Contact me to explore how I can help you create a clear path to profit. Great article Paula. You point out some great ways to spend time during those long layovers at airports, and even while en-route via air or in a car. The busy business owner can even begin to start looking at this as “extra” time that can turn into a real blessing when you need to get things done! Guilty as charged Paula! 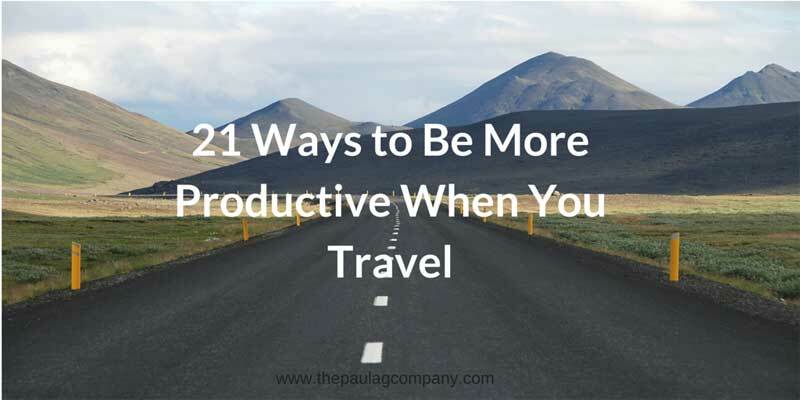 I am notorious for wasting my time while traveling. These are some great tips for making the most out of my time.